Nestlé ends contract with IAAF for fear of reputational damage. 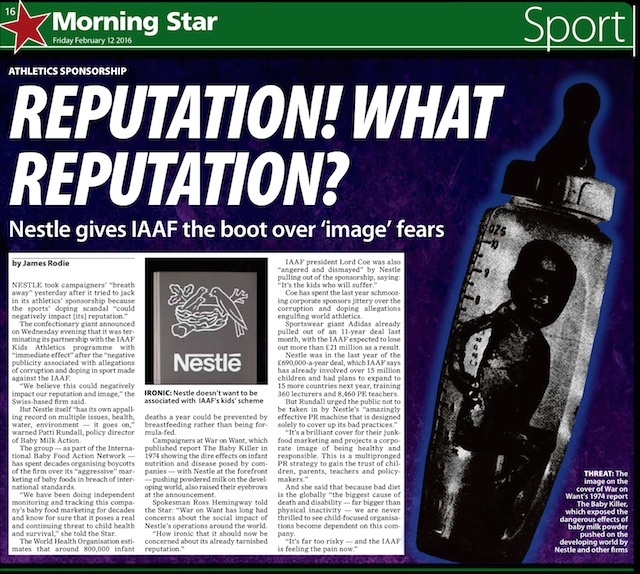 “Today’s news that Nestlé has ended its contract with the International Association of Athletics Federations (IAAF) Global Kids Athletics scheme a year early for fear of damaging its public image took my breath away. Nestlé’s Public Relations machine – a machine designed solely to cover up its own bad practices- is working overtime,” says Patti Rundall, OBE, Policy Director of Baby Milk Action IBFAN-UK. Because we know how much harm such companies do to health – bad diet is globally the biggest cause of death and disability – bigger than physical inactivity – we are always worried when we see child-focused organisations becoming dependent on food and drink companies and especially Nestlé. There must always be better ways to raise funding. Note: When people called for an end to Nestle Pure Life sponsorship of the London Marathon, where it supplied the water, the Marathon Chief Executive said the contract still had some years to run and he could only consider changing supplier once that had finished. It seems when it suits a corporation it can walk away, but those taking the money are stuck, which shows how important it is to conduct due diligence beforehand. Nestle’s bottled water business is also controversial, particularly Pure Life, targeted particularly at developing countries. Unfortunately a new Chief Executive took over and just changed to another brand that was not so obviously Nestle when the contract was up: Buxton Water.